Can Caps win Cup without clear No. 1 goalie? There's an old adage in hockey that you can't win a Stanley Cup without a clearly defined No. 1 goaltender. Two-headed monsters can work in the regular season, but a team needs stability in goal once the playoffs begin. The Capitals thought they had a strong No. 1 goalie headed into this postseason. But then Game 2 happened. Jose Theodore, the anointed starter, let in two goals on two shots in the first eight minutes of play. Coach Bruce Boudreau yanked the leash quickly in favor of Semyon Varlamov. The move proved to be effective in that the Caps eventually came back and won the game. The long-term damage of that decision, however, could impact the team the rest of the way. For his part, Theodore seemed a bit stunned that he was pulled so quickly in Game 2. Get to know Capsdefenseman Tom Poti. "I don't think I played long enough to say I played bad," he said. "I was there for 10 minutes." "That's a pretty deflating goal when you're coming out and you're all excited about playing and then the first shot goes in. And then the next shot they get goes in. So that's why I made the change," Boudreau said. But that change was far from expected, even though Boudreau would like you to believe using two goalies was in his plans all along. "I think we said before the series started that if we were going to go anywhere in this, we'd probably have to use both goalies," Boudreau said Sunday. "Whether Varly plays Monday or Theo plays Monday, I think they're both going to play again." "I told Jose last week, and he knew he was gonna be the starter, and he's earned it," Boudreau said. "It's quite a different situation than it was from this year to last year. He's been our guy, and his last loss was early January. ... There is no short leash. He's the guy we're gonna go with, and see how it goes." Well, from no short leash to a yanking eight minutes into Game 2, that's quite a change in philosophy. So now what? 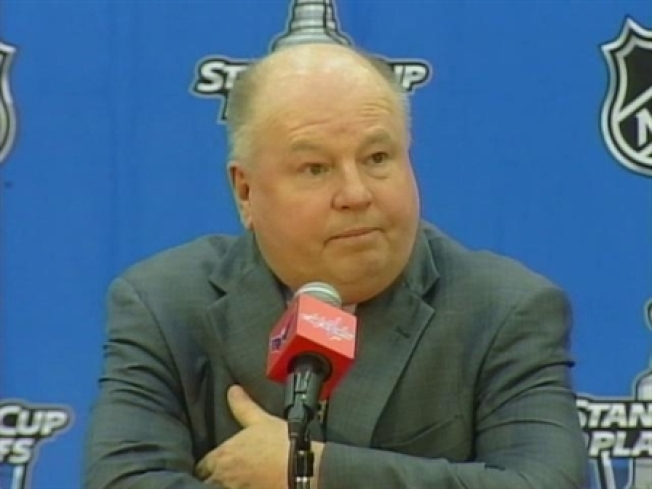 Boudreau said he'd probably inform the tandem of his decision on a starter for Game 3 on the plane ride to Montreal. And depending on which Boudreau you believe, either Theodore will get another chance to be Boudreau's "guy" or Varlamov will get another chance to prove that he can rekindle the magic from last year's playoff run.